If you have been appointed as an officer, you will now have access to Group Management Tools and Settings. 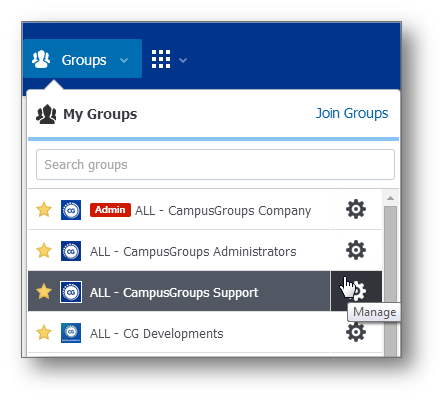 Click on the "Group" icon and click on the "Manage" icon of the group of your choice. Click on the "Group" icon and click on the group of your choice. Click on 'Manage' (top right corner). Click on "Administration" icon (fifth top icon). Click on "Goups" in the top bar. Click on "Create a new group". Enter your goup information and settings. Display your Group Management Tool Bar. Click on the "Dashboard" (manage tool bar). Review your settings and make changes as needed. While creating your group or reviewing settings, scroll to the "Sign-up Options and Membership Fees". Set up fees, captions, restrictions and duration of membership. Click on "Members" (manage tool bar). Click on the "Import" link on the left menu. Follow these three steps: download the template, fill in the columns with members information and upload the document. Once your list is uploaded, review it and click on "Upload". Click on the "Add members" button. Enter selected names and emails through the search box in the pop-up. Prepare your list and click on "Confirm". Once you have your list of members imported, you can organize an online survey to manage Elections. Click on "Dashboard" (manage tool bar), then click on "Officers" and then on "Permissions" in the top menu. Click on "Add one officer" (top right corner). Click on the "Page Settings" button (top right corner). Click on checkboxes to display specific links (Members, Officers, forum, etc.) on the right of your group feed. Once your group feed is set up, share statuses, photos, docs and polls with members. The feed is a good way to collect ideas and opinions, organize elections and generally inform people with updates. Opt-in Tags are specific sub-groups to which your members can subscribe simply by clicking on checkboxes in your group feed. Display your Group Management Toolbar. Click on "Dashboard" (manage tool bar) and then click on "Tags". Click on "Create an Opt-in Tag". Create as many opt-in tags as needed (you can add colors). You can send an email to notify members about your sub-group creations. Once members have subscribed, you can take several specific actions such as sending them emails, newsletters, etc. Share documents on your group feed. Share photos on your group feed and organize them with tags. Enter your event information and settings. You can use CampusGroups to send group emails to people who are not members. Click on the "Import" Link on the left. Since your contacts will not be members of CampusGroups, make sure to put a 0 in the 'Members' column. Go on "Emails" (manage tool bar). Select a Target Audience or select "all". Follow these quick steps: review the list of recipients, then compose your email. Add widgets of specific events. Click on "Emails" (manage tool bar) and then on "Email templates" in the left menu. Click on "Create new template". Create your template in simple text or in HTML. Template is now available in the first step when you have to select recipients before composing your email. Click on "Websites" (manage tool bar). - Webpages: To manage the Architecture of your Website, Menu and Subpages. - Colors & Graphics: To upload your Banner and Logo, change Colors Settings. - Social Networks: To add social Elements such as Facebook Like, Google +1 Buttons, etc. - Widgets: To find Widgets pulling specific Content from your Group Activities and Settings. - Options: to access advanced Options such as Google Analytics, Customized CSS, etc.